It’s been a month and half since I wrapped up Zero Waste Week, and although I am no longer buying the $4.50 half-gallons of glass-bottled milk, I am incorporating some other permanent Zero Waste changes into my life. As you may recall, I had already made most of the easy changes. I use my own grocery and produce bags when food shopping, I pack school and work lunches in reusable bags and containers; and by only buying used I avoid almost all product packaging. But there were a number of thing I planned on buying in bulk when I ran out of their packaged counterparts, one of which was cat litter. Yes I know that there is compostable cedar cat litter, but I went that route once only to be rewarded with secret kitty urine spots which included the back of the coat closet and an upholstered chair. That was a short experiment. We’ve been buying Costco clumping litter ever since. However, it comes in a big thick plastic non-recyclable bag, which has always irked me. But when a reader commented about the scoop-your-own litter at Petco I was intrigued to give it a try. Happy to discover that there was a Petco not too far from the house, (I am loathe to drive long distances for a single errand) I pointed the ol’ mini-van to Petco in the name of research. 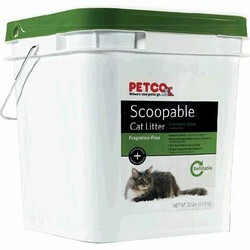 And sure enough, Petco does sell scoop-your-own litter for the packaging adverse. You are required to make a one time purchase of a pre-packaged hard plastic tub of litter, but it then forever refillable. $11.99 for a 30-pound tub of clumping litter, which can later be refilled for $9.99. This ends up costing 2¢ per pound more than the Costco litter, but even I am not that cheap to forgo this packaging-free option. So far the cats have not put up any protests, although the new litter is mixed in with the old, which should help to ease the transition. Because peeing throughout my house is not an option. Ever. The next Zero Waste change will be bulk tea, as I’m still using up the last box-and-a-half of Red Rose tea bags. And I have continued to have New Seasons put all meat purchases into compostable deli containers. We’re currently putting out around 3/4 of a grocery bag of garbage every other week. Which for a family of four is pretty damned good. Have you continued to make Zero Waste changes in your life? Please share your thoughts in the comments section below. And don’t forget to check out the Zero Waste Home blog for endless Zero Waste ideas and inspiration! Your posts about Zero Waste have inspired me to get the book from the library and read it. Now I’m looking to make some zero waste changes around here. Thank you! Yay, that’s terrific. It’s certainly a never ending project as I’m constantly learning new ideas and resources. I am going to try this. It is DUMB how expensive kitty litter is. I am also putting Zero Waste on hold at the library. Thanks, Katy! You can always borrow my copy. I ordered a second super-can from the trash company to hold all the recyclables. But now I’m aware that recycling is not a panacea. I have a long way to go to refuse and reduce! You could always bring along a trash bag, then pay for your small container refill, dump it into the trash bag, and refill again, as many times as you want. They might look at you like you’re weird, but it would work. Maybe if they’re nice, they’ll just let you count how many fills you put into your bag without having to go through the checkout each time. I usually end up going to a special pet store for my dog’s food — all grain free. And this 1 store is slightly cheaper than Petco. When I go this weekend, I will check to see their cat litter options. At least the cat litter I do currently buy does come in recylcable cardboard boxes so all is not lost. But why make an extra stop at Target, which entices me to spend more money than I have???? I am so impressed by your 3/4 of a bag of garbage every other week!! And now I am also appropriately shamed about my own garbage output. Will be looking to reduce this!! It took awhile to get to this! I buy my cat food at Costco, which comes in a plastic lined paper bag. Luckily, it’s quite easy to peel the layers apart, which I just did the other day. I do end up with some garbage, but it’s a very small amount for a large amount of food. The biggest change we’re keeping is taking our own containers to our butcher. He’s a small indepenent business and gets to make his own decisions so luckily he agreed! We’ve also signed up for CSA which doesn’t do a whole lot in terms of waste because I never put my produce in those flimsy bags in the first place but we are avoiding the metal twist ties, stickers and elastic bands. Which leads me to asking, what does everybody do with elastic bands? I can’t bring myself to throw them out so I just keep hanging them on a hook waiting for some “ah ha!” moment. Oops. That ended up in the wrong place. Call me crazy, but I bet you could eBay a large lot of broccoli rubber bands. My public library is happy to have rubber bands. They band together books on hold, so they do get used. I bought a stainless steel pan scrubbie like she mentioned on her website. It works well, I wash it in the dishwasher, and I don’t buy the throw away plastic scrubbies anymore. I worry that stainless steel would scratch my dishes. Have you found this to be true? Gotta disagree. I’ve found that the stainless steel scrubbies work really well on pots, pans, and stainless utensils. They put little scratches in glass and ceramic/pottery things. Best scrubby for those: a regular dish rag w/ a paste of baking soda and water. Much gentler. I used to buy the bulk litter at Petco until I found out that they have been cited for animal cruelty in numerous stores throughout the country. While my local store was not one found to be problematic, I couldn’t bring myself to give the company my business until and unless they ensured the safety and proper treatment of animals under their care. I buy my litter at Target or a local small pet shop chain and recycle the containers. Not zero waste, but a conscious choice. Ah, I am excited to hear where you buy your tea! I am far from being a Zero Waste Home, but just reading about your experiment made me more aware of how wasteful we are! I was using individually wrapped tea bags with a tag, but have now switched to tagless tea bags because they are at least compostable and not wrapped. But would like to know where I can buy in bulk, if it’s somewhere that’s also in Atlanta. some places still put rubber bands on newspapers. my carrier took all I had. a tiny local bike shop affixes repair receipts to handlebars with rubber bands. I give mine to him. perhaps your csa can use bands for produce. I have been on a quest for years to get as close to zero waste as I possibly can. Recycling is important, but reducing waste in the first place is my main goal. 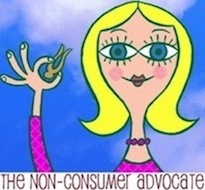 I already buy almost everything used like you do – that helps a lot. I buy in bulk when I can and I shun purchases that seem overly packaged – no matter HOW on-sale they are! My composter gets almost all of our waste and the recycling bin gets most of the rest, but there’s always more than can be done. Hummm…. I use one called Feline Fresh made out of pine which is completely flushable. I realize all cats are different in what they will tolerate, but this is the best stuff I’ve ever bought my cats because it stops odours and rarely needs to have a full-box clean-out. While you might be avoiding the plastic container, what about the used litter? We bought (back when we still had our cat – she was recycled by a critter in the woods I fear) the biodegradable litter. Then, my husband dug a hole in the back corner of our lot and we would dump the used litter in that. When it was full, we’d cover it up with dirt from the next hole. Not much different than cats doing their thing on their own outside. And while the information says not to compost it – there is a difference between composting to use in a garden and putting it in a hole to biodegrade on its own and return to the earth. To me, that seemed like a much more earth friendly option. Of course, not having a cat at all is even better … I do miss her but man, I do not miss that litter box! Since the used litter is the majority of our garbage output, I am resigned to it. My backyard is not big enough to have hidden holes. I discovered that my local Petco, in Eugene Oregon, was cutting open the 40LB bags of litter to fill the “bulk” litter bin. The clerk told me this when I arrived to get bulk container filled… he said they hadn’t unloaded the pallet of ‘bags’ to fill the bulk bin yet, and got me a 20LB bag, stating that these were the bags they filled the bin with. I don’t know how they can claim that this is ‘waste free’ option, when their dumpsters must be filled with the 20lb bags. I could see larger, reusable way to transport – like a 50 gal drum or something, but BAGS that are tossed out!!! Its still good litter, just not container/waste free. I had a type-O … 20lb bags – NOT 40. Just to clarify. Did you ask if the bags are biodegradable?